This fierce apex hunter teaches how to learn for yourself what is best for you and how to teach others what you have learned without controlling them. She is the oldest ancestor of all dogs and she once ruled the forests in harmony with the tribes of Man and herWolf medicine honors each person’s need to experience lessons for one’s self and never attempts to force a life style onto another person. Obedience to rules is best achieved through a willingness to cooperate rather than a fear of punishment. Wolf teaches us how to become teachers so that our experiences of learning can help others as they seek their own answers. The way of the Wolf is the way of listening to the silent self, and following the scent within to find ones unique way through life. The Wolf advises us when to strike out on our own and when to stay safe in the protection of a pack. Unlike herd animals, this complex social animal does not follow a pre-established trail. She makes her own path through the maze of trees, zig-zagging as she pleases across all landscapes and defying patterns of habit. She may step onto a well-beaten path to track the scent of an object she desires. But she steps off that path just as easily as she’d stepped on, forging out into the unknown with fearless confidence. Wolf medicine teaches us how to live by our own inner guidance and not get stuck in the safety of a well-worn trail. She ask us to remember how we once communicated with our animal relatives and how we once made room for all forms of life regardless of differences. 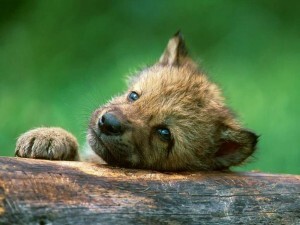 Wolf reminds us that it is possible to communicate with the all the animals of this planet. It is possible to have deeply satisfying (though subtle) relationships with life forms other than human. The animals are talking. Can you hear them? We need only listen and respond with acceptance for the vast array of differences between us all. Wolf’s body language, facial language, and vocal communication is as expressive as our own and the social order found in her family systems is often more advanced in cooperation than ours. Her tail indicates her mood and level of contentment. Unlike coyotes who howl in a chorus of individual voices, Wolves howl in harmony with each other creating a melodic song to the moon. Her voice uses whines, barks, growls, and howling with cosmic tones that can, in fact, be comprehended. Where her language may not translate into verbal expressions of logic, if we quiet the mind and listen with the other 90% of our being, we can grasp the deeper logic of her calls and we can even answer back. To learn how to do this we must be willing to learn. We must be willing to move through the humility of not knowing in order to step into the knowledge we seek. When we maintain a life-long willingness to learn we invariably become teachers. Wolf medicine is the medicine of the Teacher. A teacher is not a person with lots of information, though they may have that. A teacher is someone who has developed the ability to hold a healthy space around them regardless of outside influences. Space is the key to learning. Wolf holds the space for others to find their own. A teacher has no need to collect followers. A teacher simply proceeds on a personal path of exploration, creating space in their wake that allows others to find their own clarity as all our paths weave and cross. Every being born to Earth is a teacher of some topic for every being understands a unique perspective of life. If Wolf medicine is afoot, it may be time to share your knowledge in a more structured and formal way. Or it may be time to find an expert instructor to help you learn about your current situation. Ultimately all learning comes from the self, so a teacher can never show you how to do something. They can only show you how they’ve figured out how to do something. And with their example as a guide, you are then able to create your own way. The heart of wolf medicine is independence and she cautions young students from following people who seek to control others behavior or obtain excessive loyalty. A true teacher will not punish or respond to a student with angry aggression. Anger and pain is not compatible with learning. When seeking a teacher, Wolf medicine advises that the relationship feel safe and peaceful underneath the turbulence of the learning process. When seeking to become a teacher the most important topic to address is dissolving personal anger and opening to accepting people at whatever level of emotional/intellectual comprehension they may be at. Accepting a student at the level they are at will prevent conflict and deepen their ability to learn. Believing in people’s ability to learn is the primary role of a teacher. Before invasion, Indigenous tribes of Turtle Island lived in harmony with their wolf relatives and considered them expressions of Great Spirit. 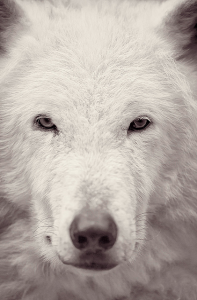 Even though the wolf was a terribly frightening creature to encounter, Native people understood that it is not possible to obliterate all threat from life. Using an excess of aggression in an attempt to secure safety will paradoxically obliterate the balance of the very life we are trying to protect. It is not possible to obtain safety once and for all. When we spend time dwelling on the fear of a possible threat we place ourselves at a disadvantage for perceiving our present situation accurately. This hunter totem reminds us to simply look at the terrain under our feet as we move and always move from there rather than from an anticipated illusion. A pack of wolves is a sophisticated nuclear family system involving a monogamous mated pair and their off spring. Positions of power are hard won by fighting and assertions of power. 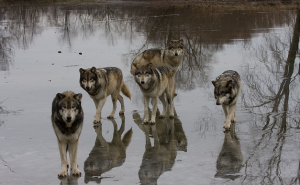 The research conducted on wolf society categorized the leaders of a wolf pack as the Alpha wolves and the followers of the pack as the Beta wolves. 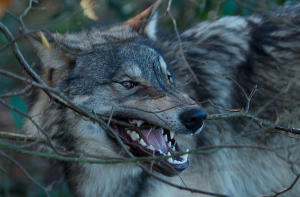 Researchers observed a second social order within the group of Beta wolves and identified an Omega wolf to be an unfortunate creature at the bottom of the social structure who often receives the brunt of aggression and mistreatment from the other pack members. But the Alpha, Beta, and Omega psychologies ‘observed’ in wolf societies were only witnessed in captive packs and never witnessed in the wild where wolves are free to disperse themselves and reorganize. In the wild, if a wolf is not happy with their position in the social order they are free to leave and live alone or find a mate in a new territory. 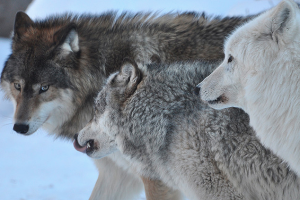 Young wolves do not stay in a pack for much longer than three years. When a young male begins to arrive into his wanderlust and desire for exclusive mating he breaks away from the family that raised him to start his own. It is this act of breaking away and forging into the wilderness alone that is the deepest message of Wolf. So the ‘scientific’ observation of abuse directed at an Omega wolf only shows how wolves adapted as a group under the strain of captivity. The alpha, beta, and omega classifications are intellectual psychological constructs and are an example of why captivity is an ineffective form of study. If we wish to learn about a wild animal, it is not possible to remove them from the very wild that makes them the way they are. But long ago, the Wolf quite willingly removed himself from the wild to spawn a domesticated species of dog which joined the family of Man as a most trusted and loving companion. Though they are relatives, a wild wolf and a domestic dog no longer share an impulse to breed together and their evolutionary differences have become too great to maintain a single classification. The domestic dog gave up the urge to rebel and yielded to complete cooperation. Even though wolves are trainable, is dangerous to keep a wolf as a pet unless you happen to have a National Park as your back yard. Unlike their ancestral off-spring, the wolf’s spirit defies domestication and the bond of loyalty to the human tribe is not secure. Any cooperation that might occur between a wolf and a person is solely a temporary agreement on the part of the highly independent, self-possessing wolf. Even if a bond is formed with a pup wolf, when the growing wolf no longer has any interest in following orders his aggression can be devastating. When dealing with a person who has Wolf medicine in their animal totem it is very important to establish a sense of freedom in your relationship with them. Wolf medicine people, though they greatly value loyalty, will not honor a situation that limits their sense of independence. The lesson wolf medicine people teach is that there is plenty of room for all perspectives and there is no need to establish ‘rules’ that confine the spirit in an effort to secure lasting safety. If a sense of freedom can be maintained it is quite possible to obtain that lasting intimacy in a much more satisfying agreement of mutual freedom. When two people enjoy each others company without the obligations to do so, they have arrived at a Wolf’s monogamy. Wolf also has a powerful connection with the moon, howling long symphonies to the night when the moon is full. People who carry the wolf totem will feel well when they find the time to sit and moon gaze and they will feel even better if they let their voice sing the tones of their feelings outside of verbal logic. 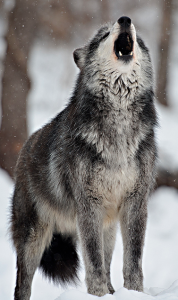 Vibrating your personal pitch and rhythm is good Wolf medicine. When Wolf medicine has visited the question at hand is about striking out alone or joining forces. Wolf is the master of both and advises never to attempt a challenging endeavor without proper backup. Though wolves to not hunt with the same degree of cooperation found in cat tribes, they understand well the value of power in numbers. If the company you are keeping has now started to limit your impulses for self expression, wolf may be calling you out into the woods for a solitary adventure to rediscover your own voice and your own rhythms. It is our desire to alone and in company. Wolf medicine teaches us how to mark our territory and define our boundaries so that people are a pleasure to enjoy and not a threat to be feared. People are only as cooperative as your ability to communicate with them. An old Navajo and his grandson went walking in the woods. The Navajo spoke to his grandson, teaching him of the plants to eat and the plants to avoid, teaching him how to read the story written in the dusty earth by the paw tracks of animals. When the old man saw that two wolves had traveled across their path he knelt at the tracks and turned to his grandson to teach him of his spirit. “Which wolf will win?” The boy asked his Grandfather.